Kit Parade – Every year, Comfort Quilts has a Summer Project. This summer each participating quilter was supplied with one of the famous Comfort Quilts Kits made by Carol Auer and Karen Carlson. Winners of the Winner’s Choice Raffle get to select from the many quilts that will be exhibited on the Cafeteria Wall at our October Guild meeting. The more tickets that are sold, the more quilts will be raffled. You may be one of the lucky winners who not only wins a quilt, but also supports the many NSQG charitable activities. Comfort Quilts – Guild members have been hard at work making Comfort Quilts; 286 Quilts have been distributed between July 2016 and June 2017. Recipients of these quilts included Westchester Medical Behavioral Unit, Ossining Children’s Center, Kids in Crisis, Northern Westchester Hospital ICU, Blythedale Pediatric Hospital, North Salem Ambulance Corps, Congregation B’nai Y’Israel (who generously hosts CQ during the summer session), Kennedy Catholic as well as many fund raisers and individual gifts. 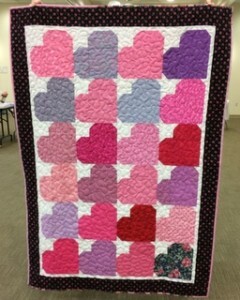 Thank you to the many members who make quilts or donate fabric for this worthy cause. Raffle Quilt 2018 – Remember to return your completed blocks for the 2018 Raffle Quilt, Jack’s Chain at the October meeting. Hurricane Harvey – Many thanks to the many members who made pillowcases for the victims of Hurricane Harvey.